From Bornhöved to Moldova: The fieldwork organized by Graduate School members this summer covers a broad geographical expanse. Experienced students hand down their knowledge to the next generation at the training excavation near Bornhöved. Jutta Kneisel, associated PhD student Stephanie Schaefer and their team have to travel the shortest distance. 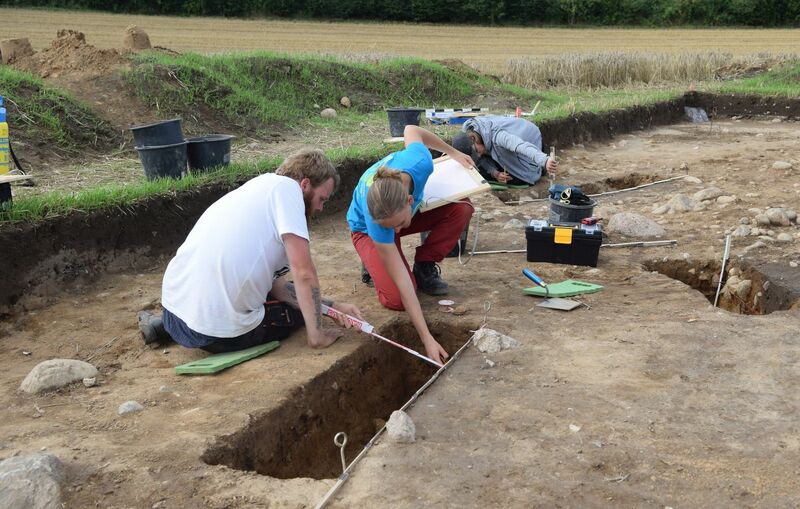 They are working on a field between Neumünster and Bad Segeberg where two Bronze Age grave mounds and possibly the remains of a settlement – including cooking pits – are situated. Among the recovered finds are several sherds and post holes, which probably date from 1500–1300 BC. 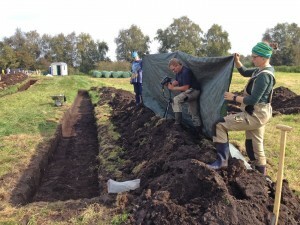 This is also a training excavation for students of pre- and protohistory at Kiel University. 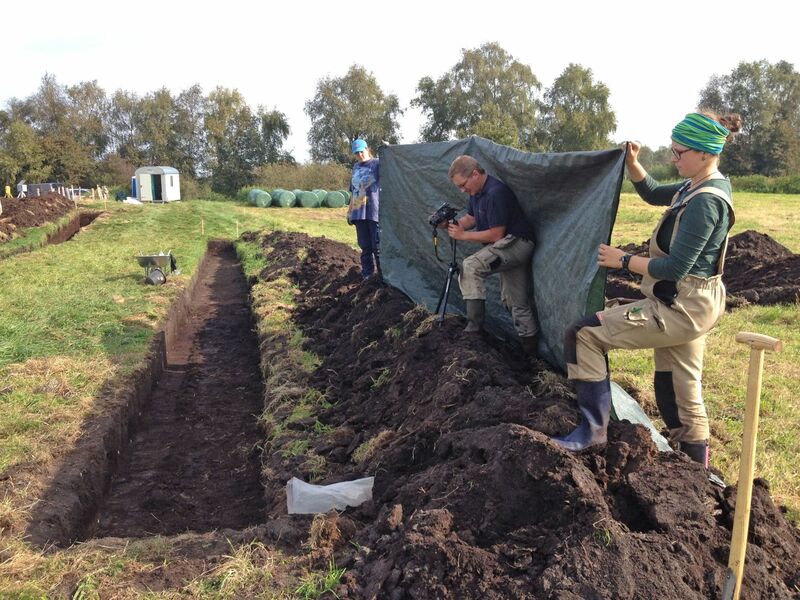 A bit further away in Schleswig-Holstein is a site where associated PostDoc Jan Piet Brozio excavates an encampment. The former island at Duvensee, now encircled by a bog, is located between Hamburg and Lübeck. Traces of the Single Grave Culture at this site might even turn out to be the remains of a settlement dating from 2800–2400 BC. Photogrammetric documentation of a trench at Duvensee. Beyond Schleswig-Holstein and Germany, associated doctoral students Anna Lena Bock and Hendrik Raese prepare the ground for a field campaign near the grave mounds of Łęki Małe in Greater Poland, about 60 kilometres from Poznań. Their geomagnetic survey and sondage on a settlement dating from 1900–1800 BC is carried out as part of the Beethoven Project jointly organized by the Universities of Kiel and Poznań (Johannes Müller and Janusz Czebreszuk). Martin Furholt and Stefan Dreibrodt have teamed up with the geophysics unit headed by Wolfgang Rabbel (including associated PhD students Erica Corradini, Diana Panning and Natalie Pickartz) to analyse the dynamics of early Linear Pottery colonization in Vrable, Slovakia. Dragana Filipovic supports the team with her archaeobotanical expertise. While early farmers still lived in single homesteads in the Rhine region, this site further to the east might represent a village of early farmers from 5300–5000 BC. Its inhabitants are expected to have come from the southern Carpathian Basin. Coring and geophysical methods are applied here to gain as much information as possible with only a minimal degree of destruction of the remains. Another level of settlement development can be observed at the central Hungarian site of Kakucs, where a Middle Bronze Age village from ca. 2000–1600 BC exhibits an area separated from the other buildings by trenches. It seems to have been especially dedicated to the production of certain goods by specialized craftsmen. 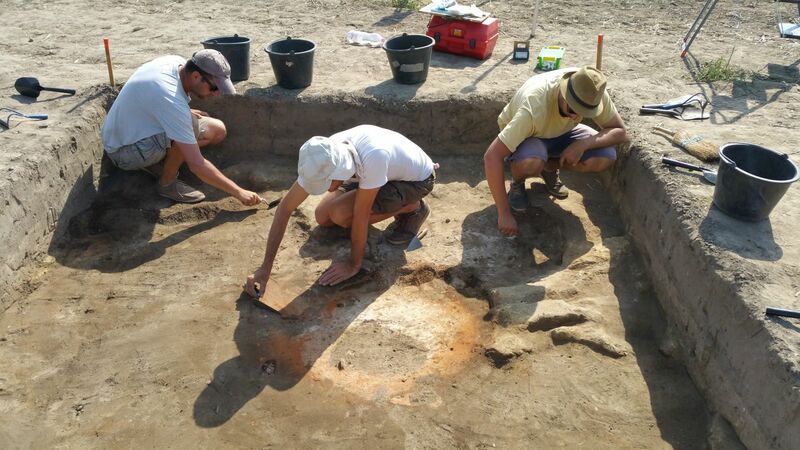 This excavation is a joint project of the Academy of Sciences Budapest, the University of Poznan and Kiel University. Among the participants from Kiel are doctoral student Robert Staniuk, associated PhD student Sonja Filatova, postdoctoral fellow Nicole Taylor, Wiebke Kirleis and Johannes Müller. A form of evolving specialization is also visible in the archaeological record of the site Stolniceni in Moldova. Here, postdoctoral fellows Robert Hofmann and Marta Dal Corso, associated PhD student Liudmyla Shatilo, Wiebke Kirleis, Stefan Dreibrodt, Johannes Müller, Hans-Rudolf Bork and their team excavate parts of a Chalcolithic settlement, which might have stretched over 25 hectares during the time span from 3900–3700 BC. A sophisticated oven has been found, which makes it seem likely that the house surrounding it was used by a craftsman at least partly specialized in making pottery. At the edge of the settlement, circular structures have been revealed which contain numerous pottery cones of different sizes. These can be interpreted as tokens or pre-numeral items. The Stolniceni excavation is being documented in a new form of outreach: a communication design student accompanies the team and uploads his drawings and reports to the blog “archaeo-lounge.com“. The excavation is jointly organized by the Romano-Germanic commission, the CRC1266 at Kiel University and the Universitatea Şcoala Anthropologică Superioară. Further fieldwork by GSHDL members this summer includes Cheryl Makarewicz’ work at a PPNA site in Jordan, Harald Lübke’s analysis of a shell midden in Latvia, and the continuous excavation of a tell from ca. 4500–4200 BC in Bordos, northern Serbia, by Martin Furholt, Robert Hofmann and Stefan Dreibrodt.